The idea of creating bracelets out of stuff from a hardware store really excites me. I'm pretty sure it goes back to when I was growing up and my dad's home remodeling projects meant frequent hardware store runs. Back then that was a guy thing, but sometimes Daddy let me tag along. I've been nuts and bolts over nuts and bolts ever since. 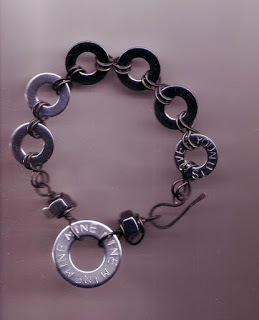 That made it easy and fun to DIY 3 funky bold bracelets that say "I'm nuts over you." I shopped for bracelet parts at my local ACE hardware store. It's big enough to have a good selection but small enough that I don't get lost. I found what I needed in a single aisle: little drawers and blister packs of nuts and washers on one side, wire on the other. I spent way too much time sorting through nuts and bolts and washers, but you don't have to. I couldn't help myself. I kept getting the same tingly feeling I get when a traveling bead show comes to town. Hardware store jewelry parts are far more economical than craft or bead store findings. Even if you buy wire, 10 to 15 dollars should cover the cost of supplies for several bracelets. Once you get the hang of it, you can make a bracelet in about 30 minutes. 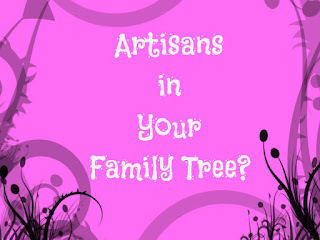 If your tweens like to make jewelry, they can follow these techniques with or without mom and dad's help. Round nosed pliers with bigger tips for larger loops. 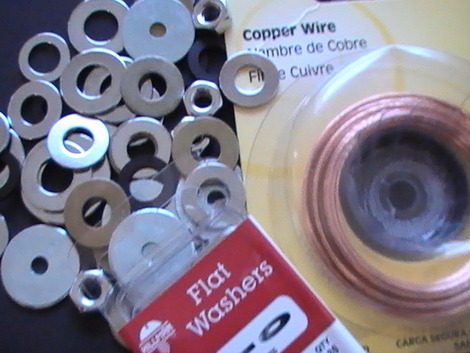 Assorted nuts and washers: I bought steel, stainless steel, brass, and chrome plated. Prices ranged from 12 cents to $1.19 each for chrome washers. 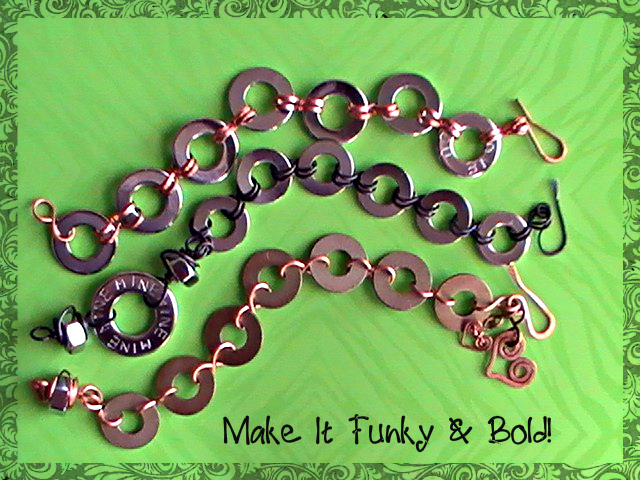 Wire, washers, and nuts make these bracelets bold, distinctive, and funky with little effort. They're easy once you learn to make simple figure 8s. 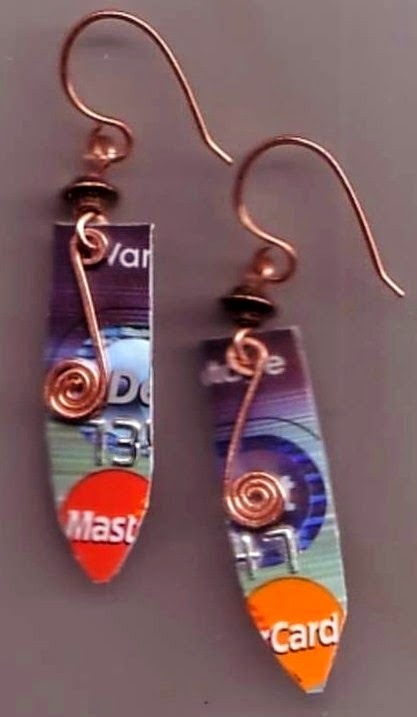 See "3 Simple Wire-working jewelry making secrets" to learn the technique. Then lay out your pieces and connect them together. Make a super easy bracelet just washers and figure 8s. 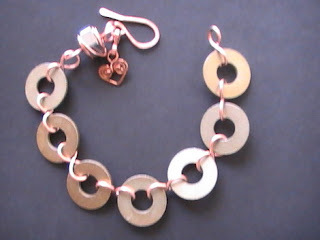 Here I used copper washers and added a bolt, a shepherd's hook clasp, and a simple heart charm to finish it off. 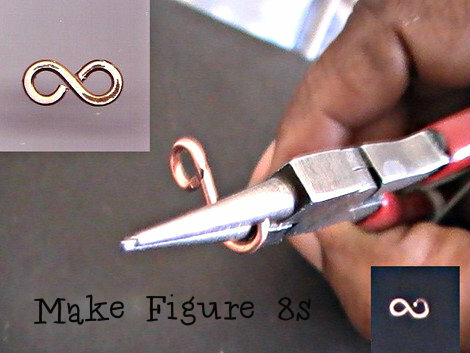 Make your figure 8s with 16 gauge copper wire. You'll find that at your hardware store too. If you use Lighter weight wire to create your figure 8s, they might not be sturdy enough to handle the weight of your metal washers. Create a simple shepherd's hook clasp to finish your bracelet. I also added a bolt and a single simple wire heart to finish the look. Use 7 chrome-plated 2 CM washers (slightly more than 3/4 inch). Make 15 figure 8s. For a different look flatten the wire first, then cut it into 1 and 1/2 inch pieces. Use 2 figure 8s to connect each washer. Finish one end with a Shepherd's hook clasp and the other with a single figure 8 for fastening. Add a large single washer for a bold focal point. Connect the Big washer with two 2 and 1/2 inch pieces of wire. 1 inch down on your wire, curve it into a wrapped loop around the big washer. Add a nut then create another wrapped loop to hold it in place. 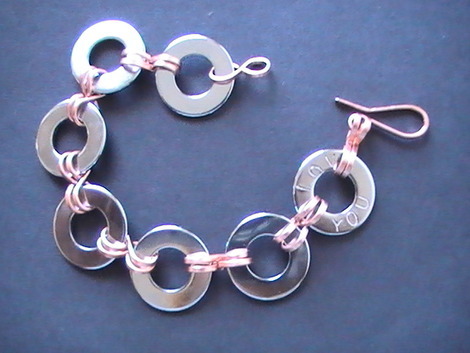 Complete your bracelet by connecting your washers and a clasp. Now that you've got the basic technique, get creative with your hardware inspired bracelets. Add a few simple touches to make them personal. Experiment with a mix of washers and wire in chrome, brass, copper and blackened steel. Try adding a few wire hearts. See "Handcrafted Jewelry: Simple Hearts" for the tutorial. To personalize your bracelets, stamp names, phrases, or a cool message right on the washer. This article is based on a tutorial I published on Yahoo Voices in 2014.